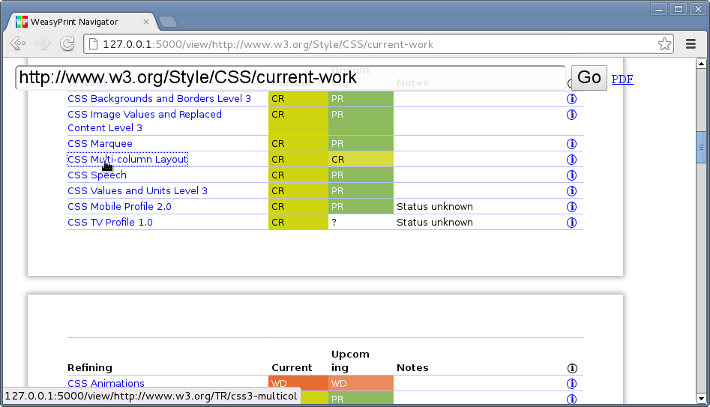 You may see warnings on stderr about unsupported CSS properties. See Command-line API for the details of all available options. If you have many documents to convert you may prefer using the Python API in long-lived processes to avoid paying the start-up costs every time. There is much more which can be achieved with the @page at-rule, such as page numbers, headers, etc. Read more about the page at-rule, and find an example here. Using WeasyPrint with untrusted HTML or untrusted CSS may lead to various security problems. Once you have a HTML object, call its write_pdf() or write_png() method to get the rendered document in a single PDF or PNG file. If you want more than a single PDF, the render() method gives you a Document object with access to individual Page objects. Thus you can get the number of pages, their size, the details of hyperlinks and bookmarks, etc. Documents also have write_pdf() and write_png() methods, and you can get a subset of the pages with copy(). Finally, for ultimate control, paint() individual pages anywhere on any type of cairo surface. Pages in the same document do not always have the same size. #   [::2] is a slice of even list indexes but odd-numbered pages. """Yield (png_bytes, width, height) tuples.""" # Print the outline of the document. WeasyPrint goes through a URL fetcher to fetch external resources such as images or CSS stylesheets. The default fetcher can natively open file and HTTP URLs, but the HTTP client does not support advanced features like cookies or authentication. This can be worked-around by passing a custom url_fetcher callable to the HTML or CSS classes. It must have the same signature as default_url_fetcher(). Flask-WeasyPrint for Flask and Django-Weasyprint for Django both make use of a custom URL fetcher to integrate WeasyPrint and use the filesystem instead of a network call for static and media files. If a file_obj is given, the resource will be closed automatically by the function internally used by WeasyPrint to retreive data. Most errors (unsupported CSS property, missing image, …) are not fatal and will not prevent a document from being rendered. The weasyprint.progress logger is used to report the rendering progress. It is useful to get feedback when WeasyPrint is launched in a terminal (using the --verbose or --debug option), or to give this feedback to end users when used as a library. See the documentation of the logging module for details. WeasyPrint provides two very limited tools, helping users to play with WeasyPrint, test it, and understand how to use it as a library. These tools are just “toys” and are not intended to be significantly improved in the future. … and open your browser at http://127.0.0.1:5000/. It does not support cookies, forms, or many other things that you would expect from a “real” browser. It only shows the PNG output from WeasyPrint with overlaid clickable hyperlinks. It is mostly useful for playing and testing. When used with untrusted HTML or untrusted CSS, WeasyPrint can meet security problems. You will need extra configuration in your Python application to avoid high memory use, endless renderings or local files leaks. This section has been added thanks to the very useful reports and advice from Raz Becker. WeasyPrint is pretty slow and can take a long time to render long documents or specially crafted HTML pages. When WeasyPrint used on a server with HTML or CSS files from untrusted sources, this problem can lead to very long time renderings, with processes with high CPU and memory use. Even small documents may lead to really long rendering times, restricting HTML document size is not enough. truncate and sanitize HTML and CSS input to avoid very long documents and access to external URLs. WeasyPrint can reach files on the network, for example using http:// URIs. For various reasons, HTTP requests may take a long time and lead to problems similar to Long renderings. WeasyPrint has a default timeout of 10 seconds for HTTP, HTTPS and FTP resources. This timeout has no effect with other protocols, including access to file:// URIs. follow solutions listed in Long renderings. WeasyPrint has been hit by a large number of bugs, including infinite loops. Specially crafted HTML and CSS files can quite easily lead to infinite loops and infinite rendering times. WeasyPrint doesn’t restrict integer and float values used in CSS. Using huge values for some properties (page sizes, font sizes, block sizes) can lead to various problems, including infinite rendering times, huge PDF files, high memory use and crashes. This problem is really hard to avoid. Even parsing CSS stylesheets and searching for huge values is not enough, as it is quite easy to trick CSS pre-processors using relative units (em and % for example). As any web renderer, WeasyPrint can reach files on the local filesystem using file:// URIs. These files can be shown in img or embed tags for example. When WeasyPrint used on a server with HTML or CSS files from untrusted sources, this feature may be used to know if files are present on the server filesystem, and to embed them in generated documents. Unix-like systems also have special local files with infinite size, like /dev/urandom. Referencing these files in HTML or CSS files obviously lead to infinite time renderings. use a custom URL fetcher that doesn’t allow file:// URLs or filters access depending on given paths. WeasyPrint relies on many libraries that can leak hardware and software information. Even when this information looks useless, it can be used by attackers to exploit other security breaches. Python, cairo, Pango and other libraries versions (implementation details lead to different renderings). WeasyPrint relies on CairoSVG to render SVG files. CairoSVG more or less suffers from the same problems as the ones listed here for WeasyPrint. Security advices apply for untrusted SVG files as they apply for untrusted HTML and CSS documents. Note that WeasyPrint gives CairoSVG its URL fetcher. If you get an exception during rendering, it is probably a bug in WeasyPrint. Please copy the full traceback and report it on our issue tracker. User stylesheets provided in the API. Keep in mind that user stylesheets have a lower priority than author stylesheets in the cascade, unless you use !important in declarations to raise their priority.